Born during the "Summer of Love", 1967. Is that a long time ago? I'm prematurely gray, but other than that I've held up remarkably well. I grew up in a stable, middle-class nuclear family in Portland Oregon, which was kind of…perfect in almost every way. I never really went to college, though I did go to art school at a place called California Institute of the Arts, "CalArts". My major was Character Animation. It was a great place for kids who liked to draw. And for me, it was the PERFECT place. After school I spent eight years doing computer animation for video games and CD-ROMS. It was a good place to start my career: I came cheap, so my employers could afford to keep me around. In time, I started drawing (and writing) storyboards for animated TV shows. It is one of the hardest but most rewarding jobs in animation. This craft took me years to learn. But once I learned it, I absoluely loved it. I still do. Now I've moved up to being a Supervising Director, where I run teams of storyboard artists and do all sorts of other jobs to help create our shows. It's a good thing to be, in this day and age. I grew up in Portland Oregon. I was the kid who liked to draw. Yay! Except… this was of no social value whatsoever. Sports was the thing you wanted to be good at, and I sucked at sports. This could be offset, a little, by being fabulously wealthy or being huge and physically imposing. But I wasn't those things either. Being a good student was another thing that had zero social value, but it was prized by all the grown-ups in my life. It was most prized by the parents who actually had scholarly children. My own parents did not have a scholarly son. They had me. I never had my act together, and when I did, it didn't stay together for very long. The one thing I did have was a mildly good looking face, and I liked getting attention from the girls at school. So I would try to get them to laugh, as best as I could. I wasn't very good at it. But at least I was trying, and this fact alone put me way ahead of the pack. This was my formative experience: I was genuinely successful at drawing. I was about half-successful at flirting with girls. I was pretty much a failure at everything else. My high school girlfriend ducked into the College & Career Center and told me to follow her. The College & Career Center? I had never noticed this place before. The Gatekeeper woman immediately asked me to leave. She knew a slacker when she saw one. My girlfriend spoke, with the voice of somebody who was absolutely sure of herself (because she was). She said "He's here to look at the materials on art schools"
In that instant, she did two things. 1) she kept us from getting kicked out of the College & Career Center. And 2) She changed my life forever. The grumpy gatekeeper woman sulked off and returned with the "Art School" folder (which didn't seem to have been looked at by any student at our school. Ever.). Inside of the folder were all of these beautiful catalogs for art schools. My girlfriend and I were supposed to be discussing something important, but I quickly lost interest in what she was saying because these catalogs were just so...wow! ART SCHOOL! Instead of college, there were these things called "art schools" where people went to learn how to make art. It was a big revelation to me. Wow! What a fun place! I'm not sure that I could ever prove, in a court of law, that I attended college. But I could show you some amazing pictures of my time at CalArts. I majored in Character Animation, which was a hoot. Mostly fun people and mostly fun times. The first two years was set up as a bunch of classes on interesting things (Backgrounds, Character Design, Storytelling, etc). But the last two years you paid a zillion dollars to just sit at your desk making a cartoon masterpiece. Which seemed like kind of a rip-off, unless you really just HAD to have that college degree [which to get into the animation industry, one doesn't really need a "degree" so much as one needs to dedicate oneself to mastering the craft]. So after my sophomore year, I neglected to sign up for the fall semester. After a few months of stumbles and doubts, I started my career. ...It didn't pay as much as most places. So it was filled with two kinds of people: Young people just getting started and old people who were failing their way back down to oblivion. I was in the first group. This was a video game company in West LA. I learned 3D computer animation, which was fascinating. But video games were not fascinating. Apparently, I wasn't born with the video game gene. Most boys would play video games 24/7 if they could, but as much as I tried, I just couldn't bring myself to love them. The little video game company started to lose money, and I was shown the door in 1998. I had a mortgage and twin babies to feed, but I didn't freak out, because I was getting freelance work from some of my friends who were working at Nickelodeon. In 1998 I was hired at Nickelodeon to work on Oh Yeah! Cartoons. The show was composed of a bunch pilot concepts that were (hopefully) destined to become their own shows. It was a place where everybody was encouraged to be a chief, but there were not enough indians to go around. Except for me. I was an eager indian. Even if I had wanted to make my own cartoon show (which I didn't), I didn't know how it was done in the studio system. So I helped other people make their shows, and I got to do everything. If a show needed props, I drew props. If it needed backgrounds, I drew backgrounds. Character design, mouth charts, title card paintings, color key, storyboards, visual development…everything. One of the Oh Yeah! pilots did become it's own TV series: The Fairly Oddparents. The show creator asked me if I wanted to work on it. I said "Sure". This was a show at Cartoon Network. It was…quite an experience. The show was put together by a bunch of ringers who were top-notch in their field…and also me. I wasn't quite such a star, and I still had a lot to learn, so I was given a kind of minor job on the show. Which made me a little sad, at first. But then I quickly realized that I had dodged a bullet. Because things didn't go as planned. For starters: we were all great friends! We were going to start a show together and everything was gonna be AWESOME! Right? Wrong. All of the top-of-their-field ringers fought like crazy. Best friends became worst enemies. There were arguments, fights, burning resentments…strife. It got kind of ugly. I wasn't really up on their level, so the arguments raged above my head. But it made me very sad. Eventually it ended with a whimper, and I was kind of shaken. I was looking for work, and Chalk Zone was looking for a character designer. Character Design! What a great way to make a living! At first there was no art director, so I reported right to the show creator. But after a year and a half they hired an art director and I had to report to him AND the show creator. Which didn't work, because they were never together in the same room, and they had very different ideas of how the show was supposed to look. Everything I drew was now always "wrong", to at least one of them. This was a great show and Rob Renzetti is amazing. 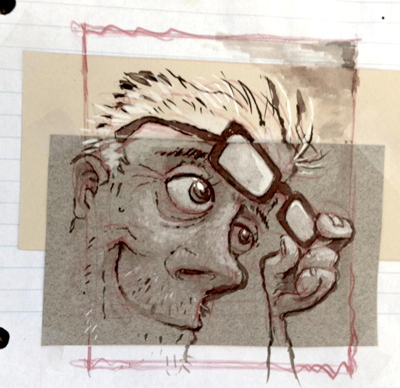 He hired me on as a storyboard artist, which was a real leap of faith, on his part. I hadn't done storyboards from outline before. It is MUCH harder than doing storyboards from a script (because you have to write it as you storyboard it). But the only way to learn it is to do it. And Rob allowed me to do it, even though I was usually in a panic and I made all kinds of dumb mistakes. Who does something like that? Rob Renzetti does! I would crawl over broken glass for that man. But really, the entire crew was awesome. I loved and still love everybody who was on that show. This was a very hard show. It was a script show that was born with all kinds of problems. The first season was very tough sledding, for us storyboard artists. But I made it through from the beginning to the end. Another extremely hard show. At the time, according to the show creator, I couldn't draw "to save my life". He fired me after my first storyboard. I was absolutely crushed, and my head was filled with apocalyptic thoughts, like: "Everybody will know I got fired and I'll never work in this industry again!" I was such a drama mama. I was merely the first guy to get fired. But as the show went on they fired more and more people. I've met a lot of former Mighty B-ers who got fired off of that show. As it turns out, it's not a small club. Back to The Replacements. My first thought: "How on earth did this show manage to get a second season?" Second thought: "Never mind, I need a job". But things had changed. They had been given a second chance and it seemed that the studio had told them that they needed to crack the whip and make sure that the artists knew that they could get fired at any moment. I worked nights. I worked weekends. I worked holidays. …I decided that I would just gut it out. I never went to the studio's head person to complain. I never ratted them out to the union (though many others did). My strategy was to be remembered as "That Guy". The guy who could take an enormous professional pounding and act like it was normal. "That guy was on the Replacements. He's tough as nails." I did make it through to the end of the season. But when it was over, I was utterly burned out. I couldn't have worked another job, even if I had wanted to. But two months later, after I had finally healed, there was another surprise in store for me. It was 2008, and the economy was imploding. All of the studios had pulled back on their production budgets, and nobody was hiring anybody for anything. One short story: My wife and I made a trip to the doctor. It was for something minor, and we went together. The receptionist told us that there was "a problem with your card". We had to go resolve it at the main office of the insurance company. We were sent to an office building in Encino. But we were instructed to go behind the lobby, where there was a woman who sat behind a window made out of bullet-proof glass. Two security guards stood on either side and watched you. I quickly realized what this was all about. I leaned over to my wife and whispered, "This is where they tell you the bad news: that your insurance has been cut off". Gulp. The lady took my card from under the slot, and punched my numbers into her computer. Then she smiled. "I just renewed your card so that it will work again. For six weeks". What she was really saying was: "If you don't get a union job, in a union shop, we're cutting you off, loser." Doom was approaching, but salvation got to me first. "Yes, yes, and THEN what happened uncle Bernie? Did you lose your house?" No, children. What happened next was that I got my dream job. Phineas & Ferb was already a smash hit when I showed up in early 2009. I had done boards from outlines before (thank you Rob Renzetti! ), so the creators, Dan Povenmire and Swampy Marsh, gave me a shot as a freelance board artist for the rest of the season. It is true that I REALLY wanted this job, and I painstakingly went through my storyboards with a fine toothed comb. But also, the show just "clicked" with me. I understood these characters and the world they lived in. I understood how the plot split off in two or three directions and joined up again at the end. It was challenging as hell, but I loved it. It pushed me. At the beginning of third season, I was brought on staff as a storyboard artist, and I spent six very happy years on that wonderful show. I would have happily worked on that show for another 20 years, if the Gods Of Animation had allowed such a thing to happen. But all of the great shows eventually end. This was a Titmouse show. Titmouse is a very small studio in Hollywood. But as a friend of mine said, "Titmouse is a great studio to make friends with". He was right. This industry is full of small studios, and it's good to know how they operate. Because you never know when you're going to tumble out of the big studios. I thought this was going to be GREAT! Some of my very favorite storyboard artists from Phineas & Ferb (and me!) were starting up this brand new show. The pilot was awesome and Disney seemed really excited by it. But five weeks after I started, Disney got cold feet and they pulled the plug on the entire show. As luck would have it, the announcement came on my birthday. Happy 47! In my opinion, there wasn't anything wrong with the show that we couldn't have fixed. But almost nobody else shared this view. Everybody else thought that it was a sinking ship, and they were relieved that Disney took it out behind the barn and put it out of it's misery. At any rate, this was uncharted territory for me. I'd been fired off of shows. I'd left shows of my own accord. I'd been around when shows shut down at the end of a season. But I'd never had a show collapse out from under me when they had barely gotten started. This is such a gorgeous, wonderful show. Wow. I would have loved to work there for the rest of my life, but it's not an easy thing to get hired on to their staff as a storyboard artist. There were a whole bunch of hoops and hurdles, and they all needed to be approved by the top brass of Disney TV. Again, if the animation gods had cleared a path for me, I'd have been happy to work there forever. I spent a (mostly) fun nine months of Peabody and Sherman. Then I was let go. There was a bit of office politics, and I bet on the wrong horse. Also, to be fair, part of the problem was me. The show never really "clicked" with me. If I treated the material gently, I was told to make it a little more edgy. If I made the material edgy, I was told to back off. I never quite found the balance of what they wanted. Which is okay. It happens. We went our separate ways and we're both better off because of it. I just did a Google search to see if this movie was ever released. Apparently it was...in Turkey. Hmm. Well, there you go. This whole production was about as virtual as it gets. There was no office, and the few pitch meetings we had were in the conference room at the condo complex of one of the storyboard artists. But I'm not complaining! This job came along in the fall of 2015, right when all of our big annual bills arrive (and Christmas!). Thank you Ping Pong Rabbit. You saved Christmas! I was out of work for about six months, and then along came this Chinese TV show. Which I was totally okay with. Maybe some beggars can be choosers, but not me. I was supposed to be working for the last two weeks of their production, but they were in dire straights and very far behind, so they kept me working for two months. This show was staffed by some very bitter, burned-out souls along with some really fun, talented young kids. But even the young go-getter kids were itching to get out of that place. I was, in all honesty, sad to see it end. It just felt so good to be working again, even it it was on a low-rent Chinese TV show in a non-union studio. Just as the show was ending, an old high school friend of mine was murdered, and I flew back to my hometown to attend his memorial service. It was really good to see my family and to see some of the people I'd grown up with. His murder reminded me that I have been so incredibly lucky in my life, even though it had been a tough year. I was unemployed once again, but my despair was gone. The death of an old friend had calmed me down somehow. I knew that things could be much, MUCH worse than simple unemployment. In August of 2016 I got a call from my old boss from Phineas & Ferb, Swampy Marsh. It was so good to hear his voice! He said that he was starting his own studio from scratch, and he’d landed his first show: an animated TV show adapted from the best-selling children’s book Pete the Cat. Was I interested in being supervising director on the show? Oh yes, I was interested. Thus began this latest phase of my career, which I wasn’t expecting or even ready for…but what can you do? A door to your future opens up and you run through it. I learned how to bring a show to life (very satisfying! ), and I learned how to fire my friends (very soul crushing). I learned about a lot of the nooks and crannies of animated TV production that I never had to know about before, back when I was a simple storyboard artist. It was a lot of 80 hour weeks and a lot of putting out fires. On the best days I thought I could sprout wings out of my back and fly…and on the worst days I'd create a problem that didn’t even exist when I got out of bed that morning (way to go, genius!). Responsibility changes you at a very deep level. It’s similar to having kids. Thankfully, just like having kids, I had other “parents” that shared the responsibility of raising our little show Pete the Cat, and of building our little studio, Surfer Jack Productions. Swampy has started this studio and done a superhuman amount of work to keep it going, but there’s more to it than just that. He’s set something in motion that’s bigger than all of this. I don’t know how to describe it, but several of us have felt it. But putting unexplainable mysticism to one side, I’ve found out what I want to do when I grow up, and it’s to keep creating projects here at Surfer Jack. Swampy is the very best, and this studio is the very best…and it’s only just getting started.